As Taiwan’s top international university, MCU welcomes students from all over the world. Whether you are interested in pursuing a degree in Communications, Design, Management, Technology, Languages, Law, or Tourism, MCU offers a unique world class educational experience. Here, we believe in building creative and innovative global citizens who are ready to become world leaders of tomorrow. Upholding the mission of “One key concept expressed three ways”, Ming Chuan University prides itself on providing an educational setting which attends to all students with parental care, support, and guidance. As a comprehensive institution of higher education, Ming Chuan University strives for excellence in teaching and learning through theory-based, application-oriented education to prepare learners with professionalism, team spirit and broad worldviews for internationalization. Our educational principle insists on theory-based, application-oriented education, which coordinates professional courses, utility courses (four years of English courses and three years of information technology courses) and general education to make sure all our graduates benefit from theory-based, application-oriented education. We implement holistic education to nurture students’ characters through seminars, graduation thesis, graduation project design, strict discipline, and diligent teaching. Our graduates compete well with their peers for both further education and employment rate. Ming Chuan University has 11 schools: Management, Communication, Law, Design, Applied Language, Information Technology, Tourism, Social Sciences, Health Technology, Finacial Technology, and International College. In step with the quick developments of globalization and knowledge-based economy, our Schools not only hire faculty members with doctorate degrees, but also orient their teaching and research with the university’s interdisciplinary integration, continuous development, competitiveness, and societal demand. To achieve this goal, each graduate school and department must promote their own professional features and competitive edge, promote the quality of teaching, research and service, and enhance students’ competence through faculty member evaluation and regular teaching evaluation scoring. In this 21st-century information technology age, students must nurture the ability to search for, analyzing, processing and integrating information. Due to the applications of network technology in the learning environment, the relevant technology is maturing. The outcome of teaching through the global information network is excellent and will be a key development for the university. To encourage multi-faced teaching and learning, our university has established a complete e-learning environment. The expansion into Network University allows students to study without the limits of space and time. Students can repeat the teaching material online to promote their learning outcomes. Network teaching allows students to learn without requiring time- and space-constrained interaction between the faculty members and students, which is a huge challenge of the traditional teaching mode. In support of networking and high-tech teaching, we have equipped all classrooms on both campuses to be e-classrooms. We will continue to develop more online courses for students to promote the quality of teaching, research, service, and students’ competitiveness. The university aims at the realization of practical education, encouraging students to incorporate practice and theory so they can enter the workforce immediately after graduation. In light of increasing globalization and global Chinese fever, the university strives to prepare students to face global competition through the integration of education theories in this Chinese institution and partner overseas universities. In addition to learning from successful education experience, Ming Chuan seeks to better nurture its students under the educational philosophy: the localization of global knowledge and the inculcation of local knowledge into the world. To achieve the ultimate goal of developing into an outstanding international university, the university will make every effort to carry forward its quality education and commit itself to international excellence in teaching and research. Creation of an international learning environment to expand the worldviews of faculty and students; promotion of international certifications; keeping abreast with education around the world. The International Education and Exchange Division and International College have led the way in good progress toward the internationalization goal. With the greatest number of foreign students of universities in Taiwan, the University sufficiently demonstrates its efforts in promoting the internationalization of higher education and building an English learning environment. Emphasis on industry-academia collaboration to reinforce theoretical knowledge and practical competence; focus on professional experience along with academic endeavors to provide multi-faceted education and life-long learning opportunities. In response to the growing needs for academic advancement, the university has made great improvements in facilitating resource sharing and its talent management system. Recent achievements include e-classroom services and e-portfolio system for students and faculty members. Determined application of strict educational guidance principles to nurture learners with a sense of responsibility and team spirit; pursuit of excellence in teaching, learning, research, and service. 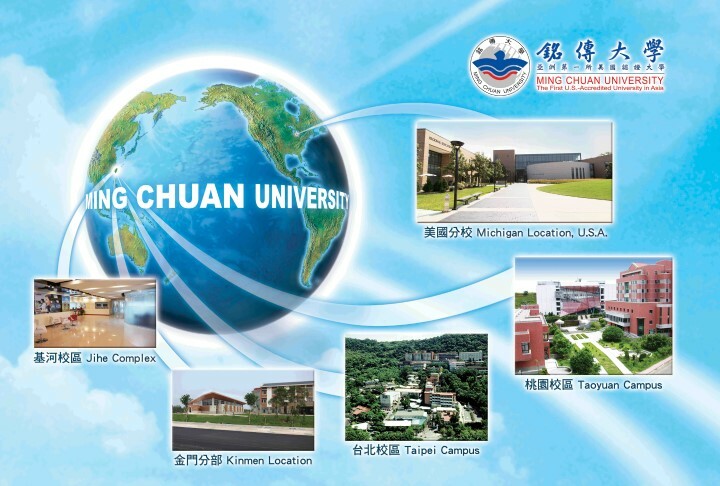 Ming Chuan University has received much acclaim for its quality education. In 2009, the university earned the top rank among northern Taiwan colleges and universities in the departmental accreditations carried out by the Higher Education Evaluation and Assessment Council of Taiwan (HEEACT). In addition, the university has been awarded MOE “Striving for Teaching Excellence” subsidy in consecutive years.